The Maziar most Iranians know about was a big Pop star in the 1970s. But the Maziar introduced here emrged in the 1990s. 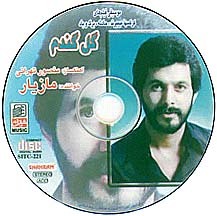 Tracks from the "Gol-e Gandom" CD which includes sound tracks from three recent films in Iran ("Karkas-haa meemeerand," Hadeseh," and "Barg-o-baad"). Songwriter: Mansour Tehrani. Distributor: Navaye Homayoun in California.